Greek Orthodox Easter Sunday is April 28th for 2019! 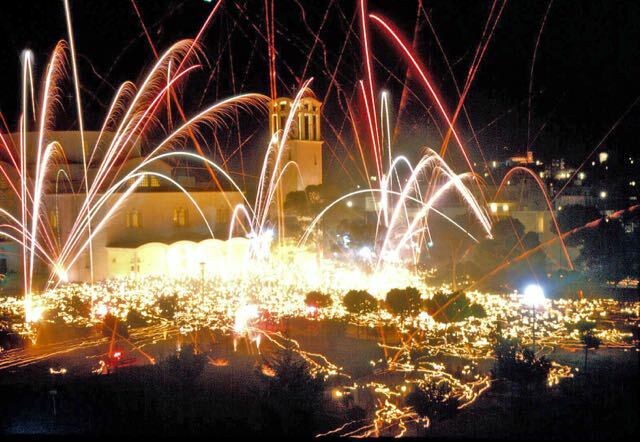 Greek Orthodox Easter Sunday is April 19th for 2020! 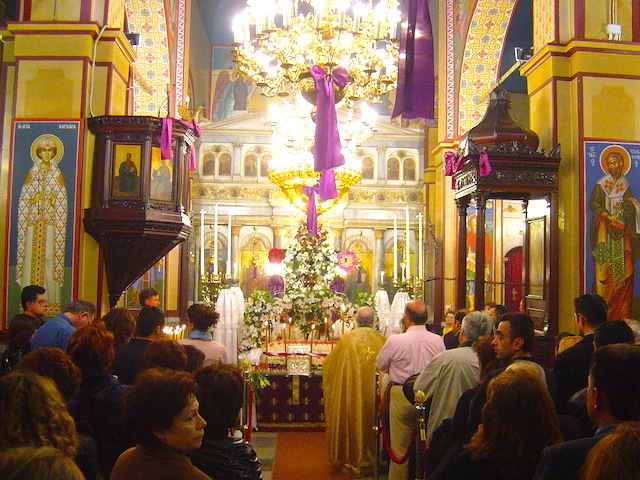 Easter is one of my favorite times to be in Greece for a couple of reasons. First of all even if you are not a devout Christian you can't help but be moved by the ceremonies and the way life begins again on Easter Sunday after winter and 40 days of fasting. If you go to the countryside or to the islands wildflowers are in bloom and the hillsides that are usually parched brown in the summer are green from the winter rains. You can't even imagine the fields of flowers and the way life seems to be popping and sprouting up from every crack and crevice. If you are not able to go to the islands or a village but have to stay in Athens, the city also seems blessed because everyone is gone. 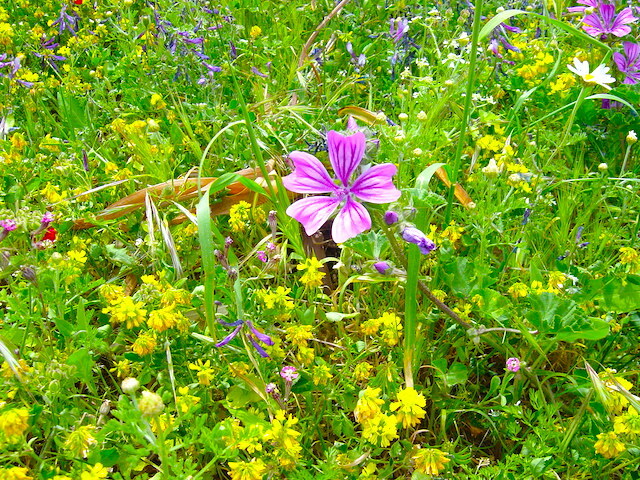 The streets are quiet and those people who have nowhere to go or who are like me and prefer to stay in Athens when everyone else has left, take walks in the streets and parks and the hills around the Acropolis which are also adorned with green grass and wildflowers. I never really cared much about the church ceremonies leading up to Easter, with the exception of the candle lighting ceremony that begins at 11pm on Saturday night and ends after midnight when all the candles held by the people in and around the church have been lit by the holy flame and they begin their journey home, each person holding one. To me there is something beautiful and magical about this. I think it is the most important ceremony in Christianity because it affects believers and non-believers. To see the church begin to glow brighter as each candle is lit and then the masses of people walking through the city streets or the towns and villages fills me with a spiritual feeling of being part of something bigger than myself. Even in the USA when I have gone to the tiny Saint Barbara's church in Durham where people take their lighted candles and get into their cars and drive home, there is something special about being on the highway after midnight on Easter Sunday and seeing the interior car next to you aglow. Lately though I have taken an interest in the whole Easter celebration, not just the Easter Sunday ceremony and then the roasting of the lamb and drinking wine which of course is my favorite thing about Easter. For one thing people ask me about Easter all the time and by telling them that for me it's all about lighting candles, eating a lamb and getting drunk they may think I am some kind of pyromaniac, gluttonous drunkard, which is only part of the story. I actually come from a very religious Greek Orthodox family. However my father was the least religious member of the family, a socialist agnostic who took us to church twice. Once when our grandmother died and once for Easter in 1963 at Agia Thomas in Goudi, Athens. It was this Easter service that had a profound affect on me. 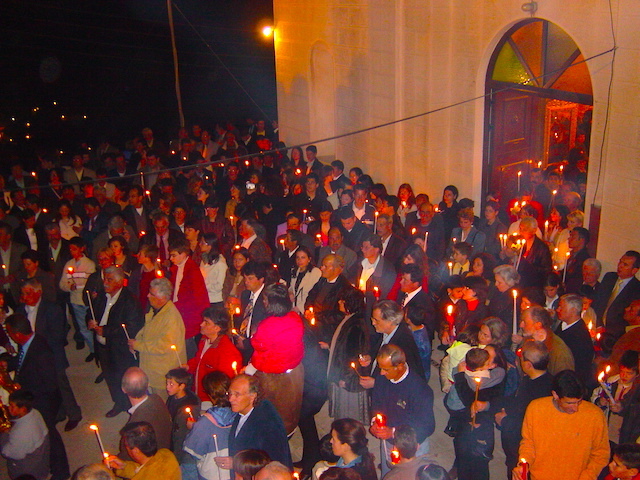 We lived in an apartment right across the street from the church and from our balcony we could see the people leave the church with their candles (photo) and the fireworks at midnight. Soon afterwards all the people left and walkied like a candle-lit parade through the empty streets of Athens while the bells rang all over the city. 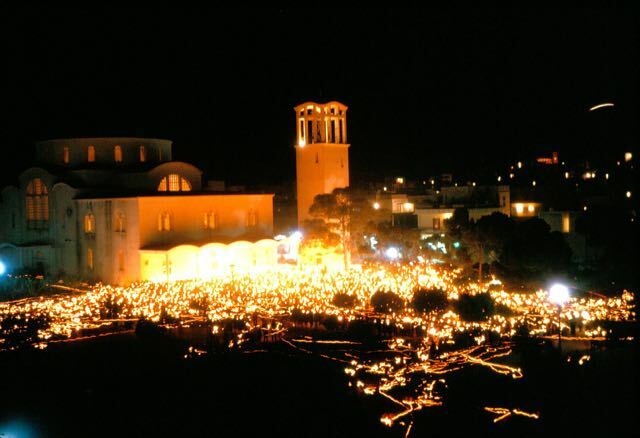 From another window we could see a procession of candles making its way down Mount Lycavettos. A psychologist would call this an imprint. I have loved Easter ever since. In 2003 John L Tomkinson, a scholar and teacher in Athens who has put out a series of books about Greece, published Festive Greece: A Calendar of Tradition. The book describes in detail all the holidays in Greece and how they are celebrated in various parts of the country. It was this book that inspired me to create this page. I suppose I could have written something about Easter before this, from my own perspective, but John's book gave me the background that enables me to make sense of my perceptions which in the case of Easter tended to focus on the lamb and the wine and everything leading up to it was just something happening in the background. 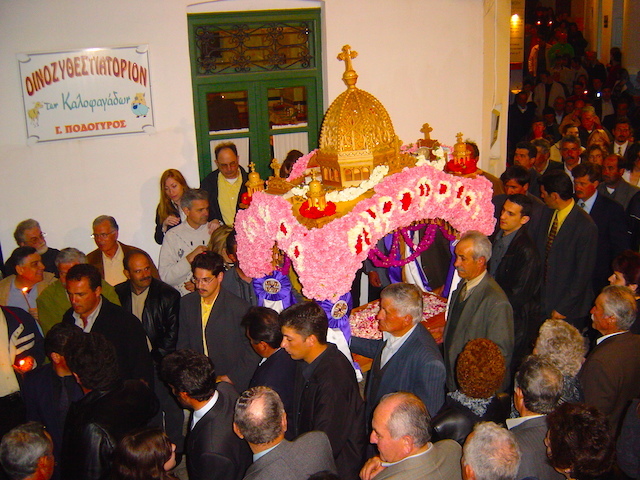 Through John's book I have more of an understanding of Easter to go with the childlike attraction I have had for the most beautiful and holiest time in Greece. On Saturday the Orthodox Patriarch breaks the seal of the door of the tomb of Christ in the Church of the Holy Sepulcher in Jeruselem and emerges with the Holy Fire, which is then flown by Olympic Airways, accompanied by high-ranking priests and government officials to Athens airport where it is met by an honor guard to the small church of Agia Anargyroi in the Plaka. From there the light is distributed to churches all over Attika and the rest of Greece. Meanwhile around Athens there is all sorts of activity this week. 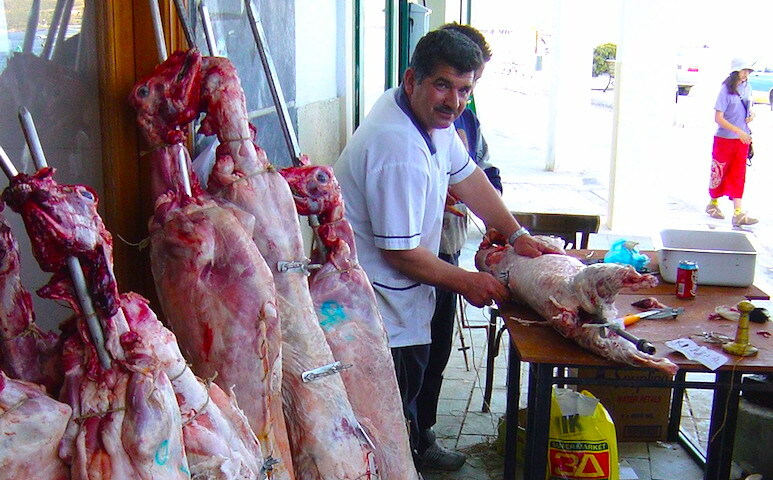 The central market has thousands of lambs of all sizes and in Psiri the annual Lamb and Cheese Market has given the neighborhood a village atmosphere as farmers from the island of Naxos come to the city to sell their goods. Athenians who still have connections to their islands and villages on the mainland are preparing to leave the city as are people with no connections. On the islands people are working feverishly to paint restaurants, hotels and shops, white-wash houses, slaughter and skin lambs, and get ready for the second busiest holiday week of the year (after August 15th the Saint Day of the Virgin Mary or Panagia). By Thursday ferries, flights and the roads leading out of Athens will be full. By Saturday Athens will seem like a giant village. It's a great time to be in Athens which is a good thing because it is a terrible time to leave because the traffic is so bad. At 11pm on Saturday night pretty much the entire country is in church. The lights are turned off at midnight and the priest announces that Christ has arisen from the dead as candles are lit from his and then from each other. The tiny glow at the front of the church grows and soon the whole room is illuminated by the light of everyone's candles. At the stroke of midnight the priest intones the paschal hymn "Christ has risen from the dead and in so doing has trampled on death and to those in the tombs he has given life". The church bells ring in celebration, fireworks go off, ships sound their sirens and the light and sound makes the 4th of July seem tame in comparison. People greet each other happily with the words Christos Anesti (Christ has arisen) which is replied to with Alithos Anesti (Truly He has arisen). Then everyone heads for home with their lighted candles where they trace the cross three times above the door and to bless trees and farm animals. Most people either stay home or go to a restaurant for the traditional bowl of margeritsa, a thick green soup made from the intestines of the lamb that will be roasted the next day, breaking their 40 day fast which began with the end of Apokreas. Gunshots, dynamite and fireworks will be going off for the next 24 hours or more shattering nerves and blowing off a finger or two. There are many traditions and ceremonies held around the country. in fact too many to mention here, but Tomkinson's book goes into great detail and is a very helpful way to decide where to spend Easter if you don't have friends or family to be with in Greece. Easter day is most people's favorite day of the year. 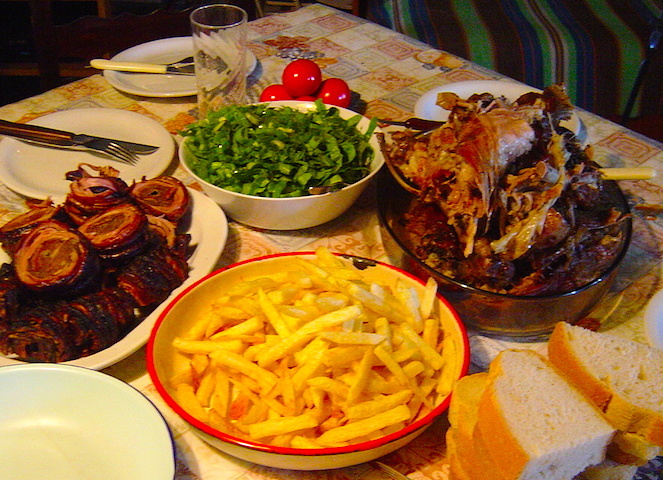 A lamb is roasted and friends and families get together to eat, drink, talk and dance. 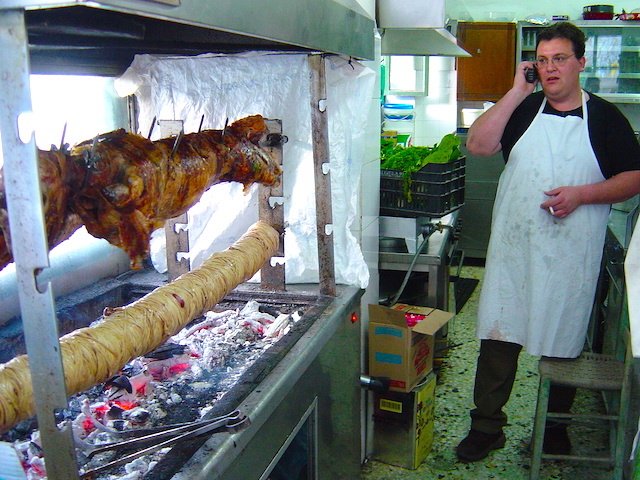 In some towns like Arachova and Livadeia, it is a community celebration with rows of lambs roasting in the village square. In other towns like Monemvasia, Rhodes, Hydra, Halkidiki, Koroni, Chania and Leros the effigy of Judas or Barabas is burned. In Syros and Karpathos people bring their guns and shoot Judas as a scapegoat for society's ills. In the town of Asine in the Argolid they actually have a street battle with the men of the upper and lower parts of the village hurling insults and fireworks at each other. 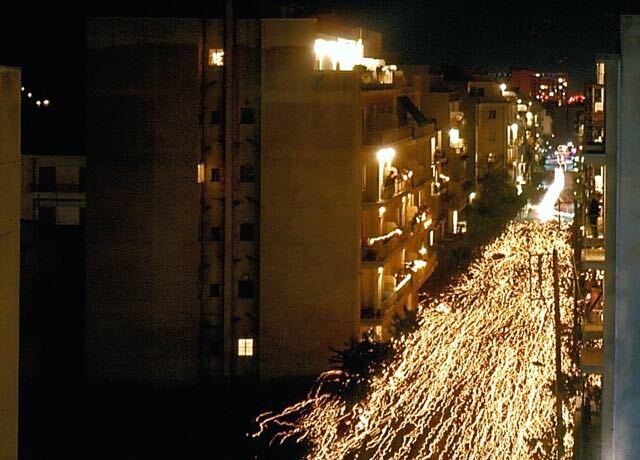 In southern Messenia people go to the main squares to watch the saetapolemos, which are rockets without sticks that the men hold while the force of the explosions makes them jump as if they are dancing. This practice supposedly goes back to the War of Independence when people of the area fashioned this home-made bombs to scare the horses of the Turks to force their riders to dismount and lose their advantage. During the afternoon the red eggs are brought out and each person takes one and hits their end against someone else's until the last person who has an un-cracked egg is considered the lucky person for the year. During the afternoon the red eggs are brought out and each person takes one and hits their end against someone else's until the last person who has an un-cracked egg is considered the lucky person for the year. 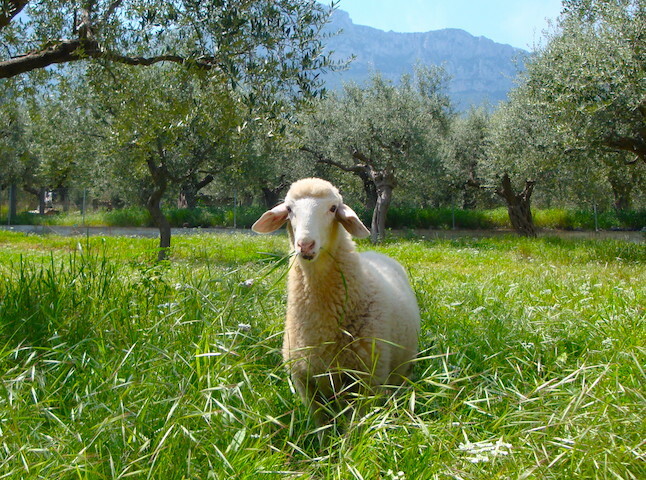 Many Athenians who have not gone home to their villages or to the islands will go up to Mount Parnitha or somewhere in the countryside surrounding Athens to roast a lamb, listen to music and dance. After their meal some people pick wildflowers and make wreaths or bouquets to bring back into the city with them. There are very few ferries running on Easter Sunday since most people are with their families including the crews. There may be one boat a day to and from some of the popular islands and a few boats to the Saronicos Islands. 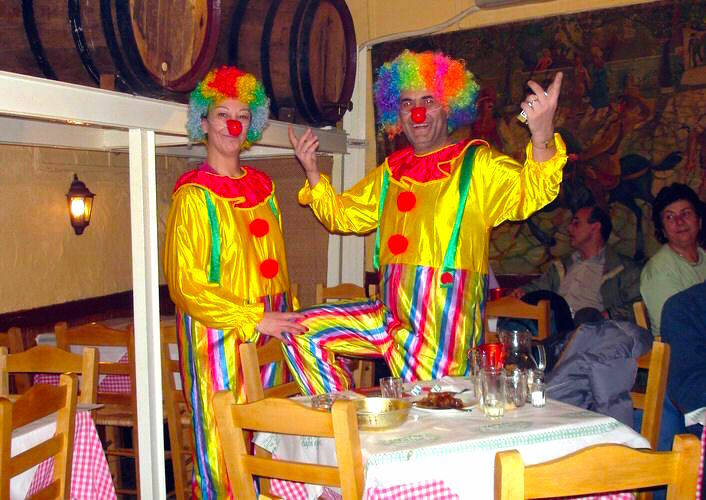 People who stay in Athens until Easter Sunday and then want to leave town to celebrate in the country have to drive. From Monday until Wednesday it is nearly impossible to get a flight or ferry back from the islands and the roads are full of returning Athenians. Athens gets busier and busier and if finally back to normal with traffic and horns blaring as people get back into the swing of city life with renewed vigor. Besides being the holiest time of the year Easter also means that in a few weeks it will be summer. There are several family-run hotels that invite guests to celebrate Easter with them. This is a great way to actually take part in Orthodox Easter instead of just being a spectator. See also Easter in Poros. Join the family at the Hotel Saga for the Easter ceremonies and celebration on the island of Poros, just an hour from Athens.